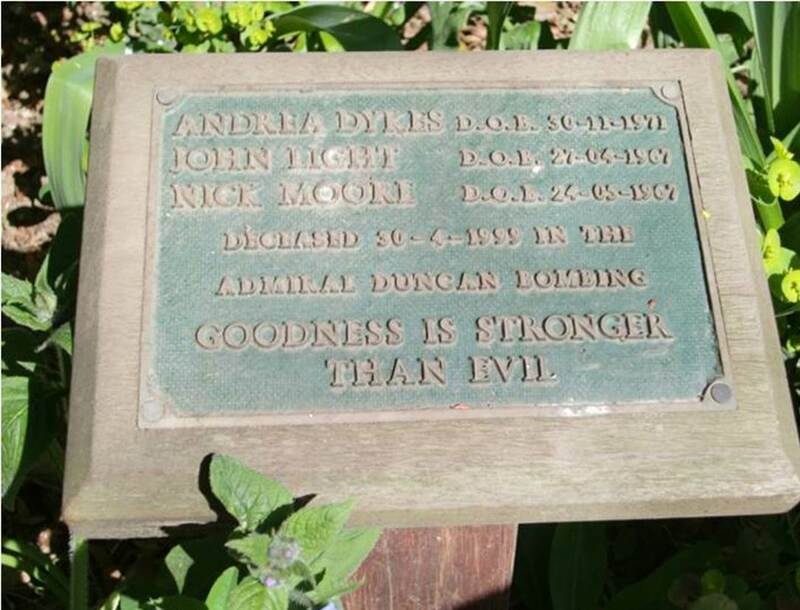 The original memorial plaque dedicated to Andrea Dykes, John Light and Nick Moore who died in the Admiral Duncan Bombing (30th April 1999) has gone missing. Mark Healey from 17-24-30 noticed that it had gone during recent checks. Mark has been in touch with the Moore family, St Anne’s Church, the local police and Westminster Council – unfortunately no-one knows where the plaque is. Westminster Council are responsible for looking after St Anne’s Gardens and have agreed to order a new plaque which will cost £260. 17-24-30 have agreed to help cover the costs so that a replacement plaque can be ordered straight away. It is hoped the new plaque will arrive in time for Tuesday service. The Admiral Duncan bombing was the third of three nail bomb attacks carried out by David Copeland who wanted to stir up fear and hatred so that the British National Party would be elected. Luckily his plan failed but not before he had planted three bombs over the course of three weeks targeting the Black communities of Brixton (17th April), the Asian communities of Brick Lane (24th April) and the Gay communities of Soho (30th April). 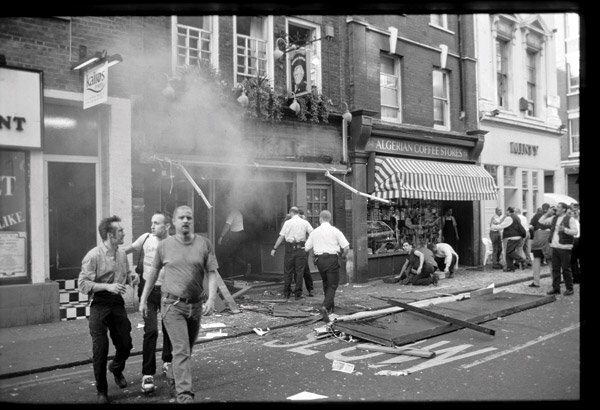 The three nail bomb attacks left three people dead in Soho and over 150 people injured (47 people in Brixton, 6 in Brick Lane and 97 in Soho). 17-24-30 was founded in April 2009 to mark the 10th anniversary of the London Nail Bomb attacks after local debate over whether or not the annual acts of remembrance should continue. Over 2,000 people joined the 17-24-30 Facebook group within the first month and the organisation (now registered as a small charity with HMRC) continues to organise and facilitate the annual acts of remembrance in liaison with the Moore family, The Admiral Duncan, St Anne’s Church, and local authorities (police and council). Since 17-24-30 has recruited volunteers to organise and facilitate similar acts of remembrance in Brixton and Brick Lane – which has been welcomed by local residents. On Tuesday 30th April people will gather at the Admiral Duncan by 6pm, then at 6.15 those who wish to take part in the service will walk round to St Anne’s Gardens where this year’s Act of Remembrance will be led by Rev Simon Buckley (New Priest in charge of St Anne’s Church) and Mark Healey from 17-24-30. There will be a two-minute silence at 6.37pm (the time the bomb exploded) followed by a song by members of the local choir Diversity. Everyone is welcome. Afterwards the really marvellous Mrs. Moore (not related to Nick Moore) will be performing a special show with donations welcome to 17-24-30. Free Entry. 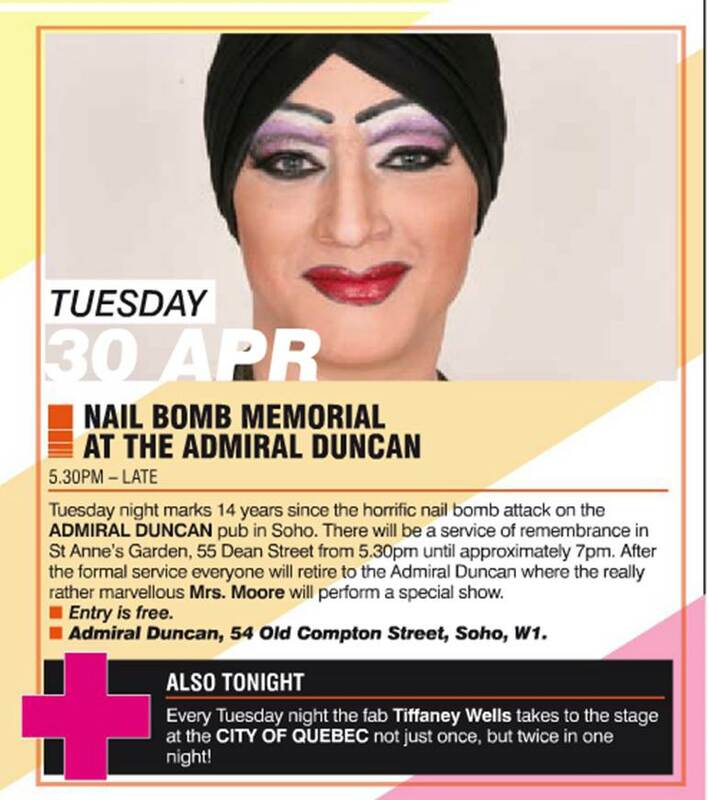 This entry was posted in April 17th - Brixton, April 24th - Brick Lane, April 30th - Soho, Westminster and tagged Admiral Duncan, Andrea Dykes, April Acts of Remembrance, David Copeland, John Light, London Nail Bomb Attacks, Nick Moore, Old Compton St, Soho, Soho bombing, St Anne's Church, St Anne's Gardens. Bookmark the permalink.